The author, Julie Frayn, gave me a copy of this novel in exchange for a review. Julie Frayn is one talented writer. It Isn’t Cheating if He’s Dead couldn’t be more different from Suicide City, a Love Story (click here to read our review of Suicide City: a Love Story; a book that I listed as one of the Best of 2013.). Frayn does one again shine a light on mental illness in a very meaningful way. This is the hot topic of the day. Glenn Close has said that the one role she regrets is the one she played in Fatal Attraction because she feels as though she played into a stereotype when her character was actually suffering from a mental illness. Frayn takes this up-to-date awareness as it is unfolding and encourages us to think twice about the huddled mass in our inner-city doorways. Colloquially called “bums,” a number of homeless face sincere mental illnesses that rip them from those they love. In the case of Gerald, his character held a job and conducted his life, and one day he was just gone. A man who at one time was on track to cure cancer. He’d won awards and been well acclaimed in his field and in the cold light of day. Jem acknowledges that there were signs she might have seen and times she should have known something was off. She holds the guilt like a second skin and though Finn comes into her life; Frayn gives us a realistic progression before she can feel good about him. A theme Frayn seems to embrace in her writing is that when life kicks you, you have to get right back up. Jem has been feeding the homeless, and she takes a few days to wallow in grief, but she knows that they need her so she gets right back up. When she meets Joseph, a new person in the park who won’t talk to anyone and scares the locals, she knows that he needs a human connection and kindness. She not only helps him but herself by talking out her demons with him. He becomes a stand-in for Gerald — not in a romantic sense but in the knowledge that she has a second chance to help someone in the way she feels that she should have helped Gerald. The thing is, Frayn doesn’t lead her character to unrealistically jump in and save the day. Instead, she eases Jem into the plot. Jem consults people and builds the relationship and yet the story never feels as though it drags. Frayn is a master of the minute detail. In one scene when Finn is holding Joe, another homeless person steps over and asks if he’ll be okay. Jem says that he will and the person “That’s good … good for you, Chief.” (Kindle Edition Page 225) as he wipes tears from his cheeks. The depth of emotion conveyed in that one line is stunning. She also has a talent for no matter how bad things may seem within the stories or for the characters and no matter how bad they might turn out, hope shines through. The secure knowledge that life has ups and downs but that one day everything will be the way it was meant to be. Frayn is now on my list of authors to watch. If Suicide City: a Love Story underlined her talent, It Isn’t Cheating if He’s Dead highlights her talent in neon and sends it into the sky. 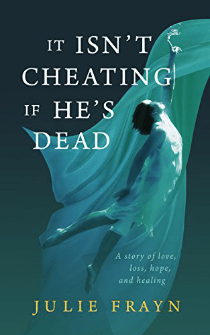 It Isn’t Cheating if He’s Dead is a book that will make you smile and cry and cement a relationship with lasting characters while leading the reader to look at the world around them with new eyes. Check out our reviews of Julie Frayn’s A Trilogy of Unrelated Shorts, Suicide City: A Love Story, Goody One Shoe, Two Wins and an Honourable Mention, Mazie Baby, Suicide City: A Love Story and her latest release Pocket of Bones. Thank you for your comment. It seems after each of Julie’s stories I’m left reeling. The mastery of language and the skill she employs in plotting. Excellent work. This is a great novel. Anything that brings tears to the eyes and makes one think is a five star read but this went above and beyond that. Great book.